It’s not unheard of for two bucks to be seen with their antlers locked together after a battle. Tales have even been told of hunters rescuing a live deer locked with a dead one. But what is a little more odd is when two deer get locked not by their antlers, but by something else. In the case of the video below, that “something else” was a nylon rope, and the two deer needed the help of a Texas game warden. 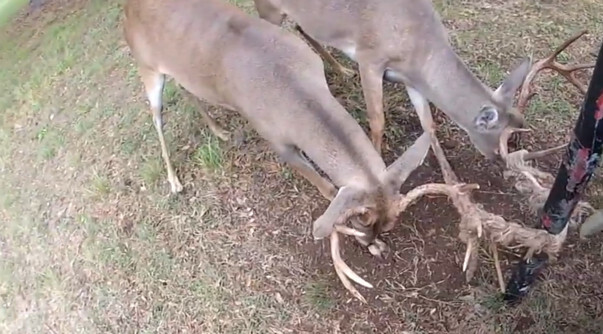 In a video posted on Monday by the Texas Parks and Wildlife Department, two big bucks are seen tangled in a rope that is wrapped around a clothesline pole. A game warden from Comal County, just north of San Antonio, is tasked with the dangerous of freeing them. What does he do? He uses his truck as a barrier and gets out his knife. “Come on guys, help me out,” the warden can be heard saying as he tries to free the deer.